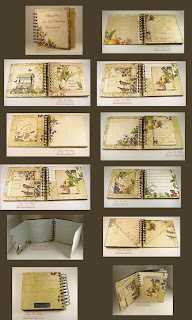 Many of you know I'm taking an on-line Bind-It-All class through www.mycreativeclassroom.com the above photo is of the project I completed today. I'm very happy with this project. The photos don't do the project justice. Nan (our instructor) had us make gate fold and split pages and they turned out better than I would have imagined. I am sooooo very glad that I signed up for the class. Well....I'm off to bed, I've been at it since early morning....Take care and have a wonderful week. OMGosh! Mary this is gorgeous! I love it! Mom, it's beautiful!!! You're such a talent!